Whether you’re suffering from a broken bone or a life-threatening illness, a trip to the emergency room is always a scary prospect. But what happens when an ER is faced with more patients than it can accommodate? Between 1995 and 2010, annual ER visits in the U.S. grew by 34 percent, while the number of hospitals with ERs declined by 11 percent. From long wait times to sky-high medical costs, overcrowding puts undue pressure on patients, providers and administrators when efficient, high-quality care matters most. 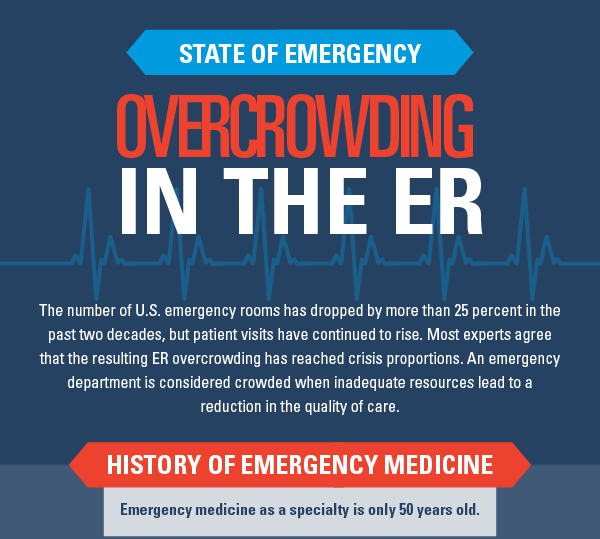 The online MHA degree program [email protected] created this infographic to show the impact of overcrowding on U.S. emergency rooms. The graphic looks at some of the major causes of congested ERs, examines the impact on care delivery and explores proposed solutions to the problem of overcrowding. Help us raise awareness of this important issue by sharing the infographic below.